The name may sound cute-sy (it's also a Fleetwood Mac song), but Honey Hi is serious about making flavorful, healthy dishes for the Echo Park crowd. The minimalist shop features a deli case and a fridge full of locally made goods—kimchi, kombucha and vegan cheese to start. Grain bowls dominate the menu: That One Bowl is a colorful mix of quinoa, pesto kale, watermelon radish, roasted pumpkin seeds and a turmeric poached egg, while the Miso Bowl is a little more hearty, with jade rice, cabbage, carrots, shredded chicken, ginger chickpea miso and spiced almonds. A selection of tartines abound—be sure to try the freshly made chia jam with tahini, bee pollen and torn mint. And before you leave, a chocolate chip cookie—gluten-free and oh-so-gooey—is in order. Interesting variety of offerings at this Echo Park brunch/lunch spot. From sandwiches to rice bowls, toasts to chia bowls, there's something to please every palette. While something can be better than others, there's so many intriguing combinations of ingredients that you will find something to love. The smoothies feel healthy, and the Pink Drink is very eye catching. 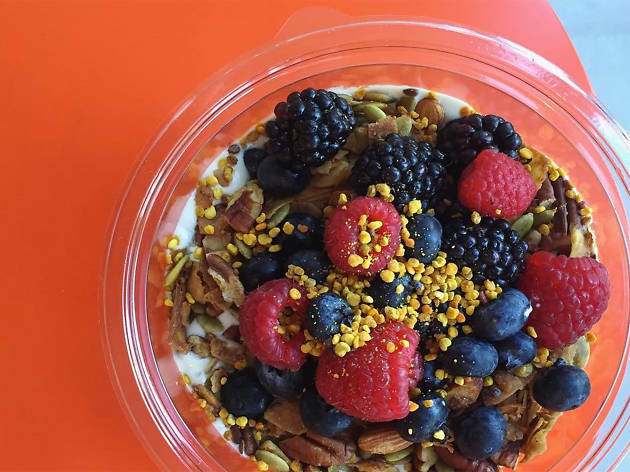 This is a great new spot in Echo Park for healthy eats. Most of the options here are inventive and well-executed, save for a couple that feel like I could make them at home. The prices are a little steep, but they're very clear about using only the best ingredients, so I get it. The shop feels a bit empty, but they've only just opened, so many more plants/decor/grab-n-go options are on their way. Regardless, I'm glad to have Honey Hi as an option! I hope they eventually start dinner service. What a cute shop! Honey Hi is a welcome addition to Echo Park, though it definitely has room for improvement. Here's what I love: the miso bowl, the chia jam toast and the chocolate chip cookies. 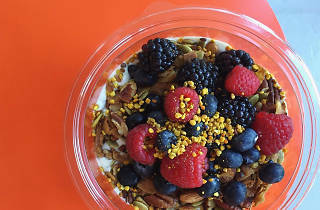 I tried another bowl that was a little lackluster - and the service could use some work - but I can't wait to see what else this healthy breakfast/lunch spot has coming up.